This is carried out to change the contour of the denture over sore spots; to improve the chewing efficiency by correcting the bite; or to change the shape of the denture teeth or denture base itself to improve its appearance. Tightening the clasps is also included within this item number. Tip: It is always best to push dentures into place with fingers rather than by biting pressure, as this prevents the clasps (or retainers) from bending out of shape and becoming loose or even breaking. Care must be taken by the dentist to bend clasps on casted dentures (item 727, 728) is greater as they of a harder metal which can crack or break. The retainers on an acrylic denture (item 721, 722) are called wrought retainers. They are more flexible but can bend out of shape more easily. 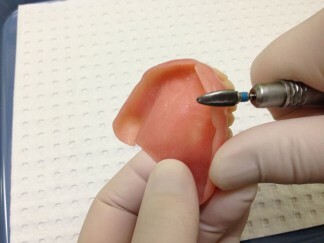 THIS SHOULD ONLY BE DONE BY A DENTIST, AS ITS SHAPE AND POSTION ON THE TOOTH IS HOW THE RETAINER HOLDS THE DENTURE. Flexible acrylic denture retainers are at one with the base and can be tighten by bending the retainer under hot water then setting the shape by putting it immediately under cold water. (This will be expanded on in a future blog). This item is not to be used after a new denture has been given or after a repair has been made. 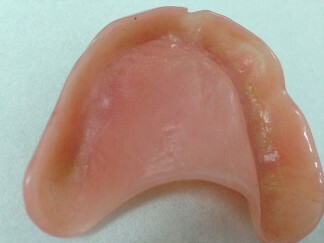 This is the addition to the tissue fitting surface of a complete denture to improve its fit to a changed mouth. Materials are used to record the space between the mouth and the denture. This procedure in the laboratory uses acrylic that is “cooked” at a high temperature and is as hard as the original acrylic in the denture. It can be done in one day. Relines are commonly done when teeth have been removed immediately before a new denture is made, or after some time with an old denture. The bone is resorbed when teeth are lost. Most of the bone is lost in 2 months after a tooth is removed, but it continues throughout life. As for 743 but on partial dentures. Replacement of the resin base of a complete denture, but keeping the original denture teeth, with or without rearranging them. This is to improve the shape, fit and appearance of the denture. This is more complex than a reline and may need extra visits. As for 743 but using a self or light cured material. These materials set at room temperature after recording the change directly from the mouth. They are not as hard wearing as a processed reline. The cleaning and polishing of a pre-existing denture not to be used with any other item of maintenance or repair of the denture. This is an addition to a denture base to enhance its appearance or function. But next week we will take a break from dentures (no pun intended), to introduce our newest dentist to the Seymour Dental Bunch – Dr Dilara Yashin.